Coffee Tycoon Game Review - Download and Play Free Version! Manage employees, upgrade your menu, open new stores, and choose your style of coffee shop! Coffee business grows at a surprisingly rapid rate. Computer does most of the work, leaving you with little to do. Sales and money are unpredictable. 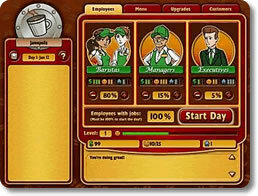 Coffee Tycoon is a fun new business simulation game that will have your brewing the big bucks. Coffee is a multi-billion dollar industry and you are ready to grab a piece of it! Choose your style of shop - from elegant, high end coffee to a wacky entertainment hangout to a basic shop - and decide how you will build your java empire! Decide the right balance of baristas, managers, and executives to help your flow of cash, customers, and new shops. Choose to invest your earnings on employee benefits, equipment upgrades, new menu items, or more stores. You will have adjust your strategy to keep gaining new customers and having enough money in the bank. Coffee Tycoon will challenge your ability to meet customers needs and effectively balance the growth and variety of your business. With 5 different cities to compete in, 5 styles of coffee shops, lots of possible menu items, many upgrade options and a large assortment of customers, you will have a blast building your business and making people happy! 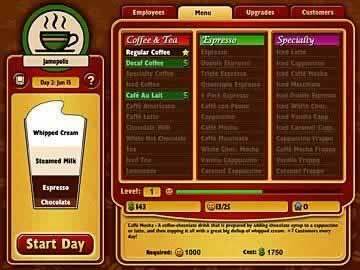 Coffee Tycoon is a business simulation game that has you not only start and run a coffee shop, but also build a coffee franchise. 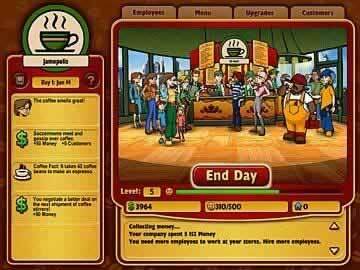 The game calls upon you to build a coffee empire, but doesn't give you enough control. You will have the power to start and end each day, but this game prevents you from fully interacting and engaging. You might feel more like an observer rather than a player in Coffee Tycoon. The logo, business name, and business location are all options you have control of as a user before play begins. However, your individual power begins to fade as the game starts. On the surface Coffee Tycoon looks easy, and once you start playing you'll soon realize that at it's core it is easy. Coffee Tycoon is a really easy game because you don't have to do much. The computer takes care of almost everything. Winning and losing is more dependent on chance and less concerned with skill. You will not have to be good at this game to succeed. In fact, you won't really have to pay attention because the computer will do most of the work. The premise of the the game is as follows: You are the CEO of an up and coming coffee franchise in one of five major cities (New York, San Fransisco, Seattle, Chicago, or Los Angeles). You employ three types of people. Baristas who make and serve the coffee, managers who make sure the businesses are running smoothly, and executives who scout different businesses. You decided what percent of your business you want each to have and divide it accordingly. For example, if you want to look for more business locations you should give higher percentage to the executives, or if you want faster service invest more of your business in the baristas. Once you've decided on employment you start your day (by clicking the start day button). As the day progresses you will gain customers who will eventually give you money. Like most other simulations, you take that money and purchase items like different coffee types, benefits for your employees, or advertising to make your business grow. Once your purchases are made you click “start day” and the cycle repeats. Each day you have no idea of how much money you will make and you have no control over whether or not you increase or decrease your businesses. Everything is left to chance, making this game especially frustrating if you have a strategic mindset. One cool feature you might uncover in this game is the “recipe guide”. Each of the coffee items you purchase show a clip art description of the recipe in the corner of the display. This is a subtle addition but is great. The coffee world and coffee drinks are sometimes a mystery so this recipe guide is great for teaching you about different coffee drinks. If you don't know that the only difference between a latte and a cappuccino is foam, you will learn because of the recipe guide. One other feature that makes the game somewhat enjoyable is the rate at which your business grows. It seems like you'll add at least one franchise a day, growing your business at an incredible rate. This concrete evidence of success makes you feel like you are achieving something, even though the computer is doing most of the work. Overall, there isn't much to say about Coffee Tycoon other than the fact that you'll feel like the computer is doing most of the work. This is more of a sit back and relax type of game, rather than an interactive simulation. You might find the instant successes you have intriguing, but that sense of intrigue may fade after your realize you have little control over your company's successes. This game is for relaxed tycoon game players looking for an easy time. If you are interested in playing an active role in your game, you should keep looking.